Hoffstot S&P debuts MYSTERY OF SIMBI_XOMBIES underground music comedy series on Singapore-based video entertainment platform Viddsee.com, complete with original soundtrack, encompassing genres from K-pop to alternative to reggae. The movie’s futuristic message is supported by the 360ºVR feature-length Director's Cut, which opens October 31 at Über Reality (ÜR) Theater, plus the innovative story blockchain which will enable commercial adaptations and remakes. 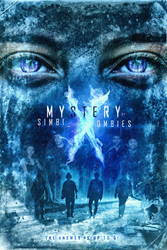 Hoffstot Sound & Pictures today made its underground music comedy, MYSTERY OF SIMBI_XOMBIES, available to watch for free on Viddsee, as a nine-chapter series. It originally premiered in ÜR Theater on January 1, with parts releasing periodically until October 31. Written and directed by David Hoon Kim, the film follows a Brooklyn grunge band whose reggae comeback on the web, perfectly timed with an outbreak of corporate altered foods, unwittingly triggers a global ‘Xombi’ rebirth. “As the youngest from Generation X, I feel compelled to honor our fallen heroes, and engage the corporate colonization of culture and music since the ‘90s.” said Kim. The Kickstarter Staff Pick features an Original Soundtrack written by the band SheepPsyche, including genres that range from K-pop to alternative to reggae. In keeping with the futuristic theme, the feature-length Director’s Cut (releasing October 31) boasts a never-before-seen VR viewing experience, complete with unique moving 360º camera shots plus clever edits, presented in a virtual reality theater. Releasing October 31, the Über Reality (ÜR) Version shall be available for sale in ÜR Theater, including: the (1) 360ºVR Feature Director’s Cut download, (2) Behind-the-Scenes Secrets, plus (3) Commercial Story Rights via blockchain. The Original Soundtrack shall release separately, on the same day. Hoffstot Sound & Pictures (HS&P) is a grassroots Brooklyn studio producing futuristic movies and music, leveraging its Über Reality® Theater platform to share copyright blockchain licenses catalyzing new authorship in the global public. Viddsee is a leading video entertainment platform for short premium content. With over 1 billion views powered by data insights and a trusted community, we empower storytellers by enabling the creation of films and amplifying stories to targeted audiences.